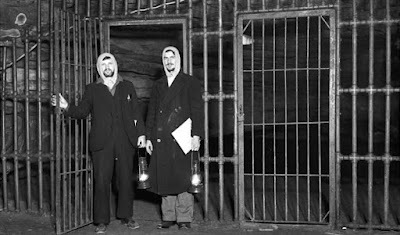 The Insomnia Blog by Sleep Doctor Michael Breus, Ph.D.
Cave experiment by Nathaniel Kleitman and Bruce Richardson. Kleitman and Richardson exit a cave after a 33-day experiment to determine whether the human body-clock can be adjusted. Mammoth Cave National Park (Kentucky, USA), Park Museum Collections. It feels like I have been in a cave for four years and away from the field of sleep medicine. After a false start, I am trying again to be a maven, connector, and writer on sleep. Perhaps the world is catching to me or I am catching up to the world. Sleep, healthy, restorative, life-saving, disease-reducing sleep is on everyone's mind now. I return to add my voice in earnest and to advance the cause of what we do with one-third of our lives when things are working as they should. To quote Whitney Houston: "I believe the children are our future." The problem of sleep-disordered breathing is epidemic, like diabetes, heart disease, and obesity. I would argue and have elsewhere in this blog that all three of those conditions can be attributed to, at least in part, the chronic intermittent hypoxia that occurs when the person sleeping is not getting air into their lungs. For the most frightening development (if you can call it that) is the increasing occurrence of the conditions listed above in children. The prevalence of sleep-disordered breathing is 3 to 5 percent among all children - this is scary! One of the many challenges for the field of sleep medicine seeking to address this problem in a cost effective manner. Of course, in lab polysomnography or even a sleep study done at home would provide more data reducing the possibility of false positives or false negatives, but the number of children at risk is too great and the cost in either case is prohibitive. A study published in the ATS Blue Journal provides evidence that use of oximetry aided by computer analysis alone was sufficient to screen children to determine who needed an intervention. This could be at a significant savings (90 to 95%) over what the cost might otherwise be. As described in the study this machine learning enabled test can provide an inexpensive test to anyone who has access to a smart phone. An increased awareness about the importance of sleep particularly among children coupled with the ability to screen for sleep-disordered breathing cost effectively should, I would say must, incorporate this into to all pediatric practice. The field (calling all Clinical Sleep Health Educators) has its work cut out for it to disseminate the availability of this technology to help insure there will be children in our future. Again to quote Whitney Houston: "It is the greatest love of all."